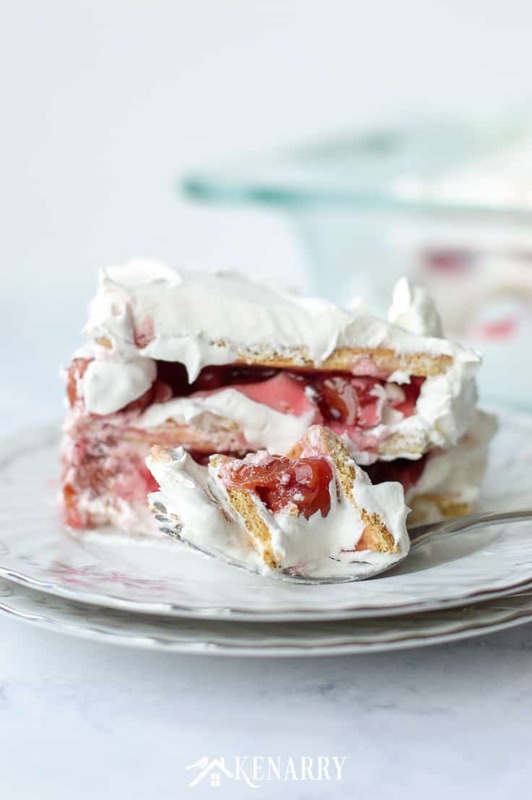 Love cherry pie but hate the fuss of baking in the summer? 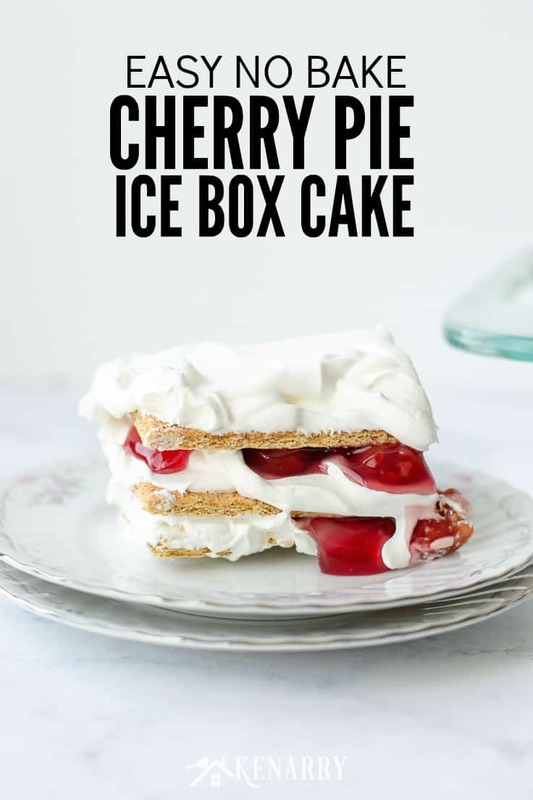 This No Bake Cherry Pie Ice Box Cake uses just 3 ingredients. So it’s the simple and easy dessert idea you’ve been looking for! Who likes to bake when it’s crazy hot in the summer? Me neither! When Meaghan from Cook. Craft. Love. 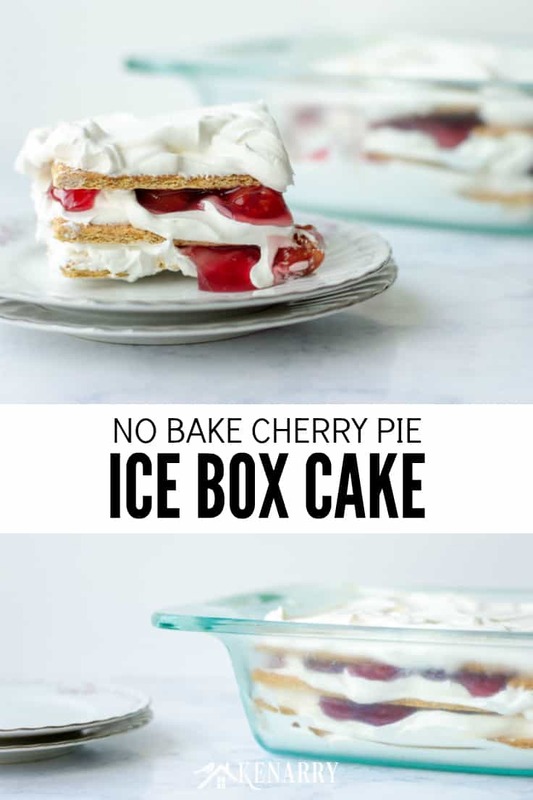 sent over the recipe for this No Bake Cherry Pie Ice Box Cake, I just knew it was perfect to share with you right now. Temps have been sweltering here in Michigan and across the country this summer. 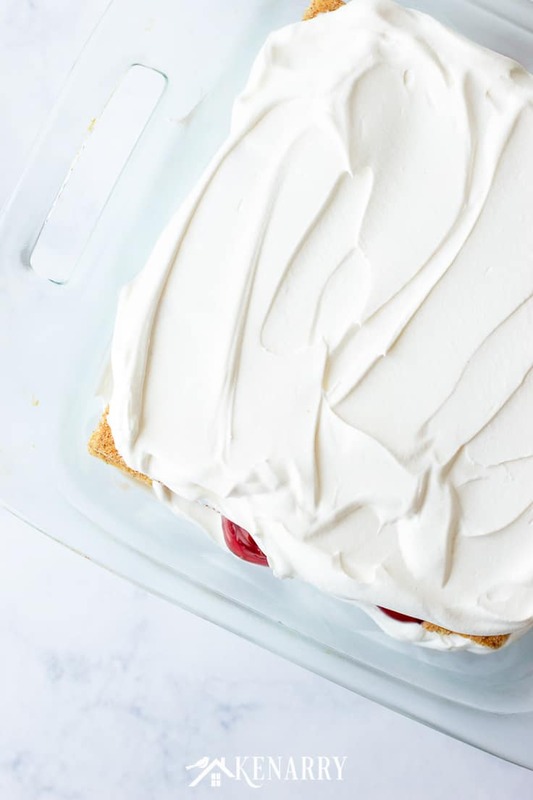 If you’re a big fan of easy cherry desserts, Meaghan also has several other great ideas for you on her website. 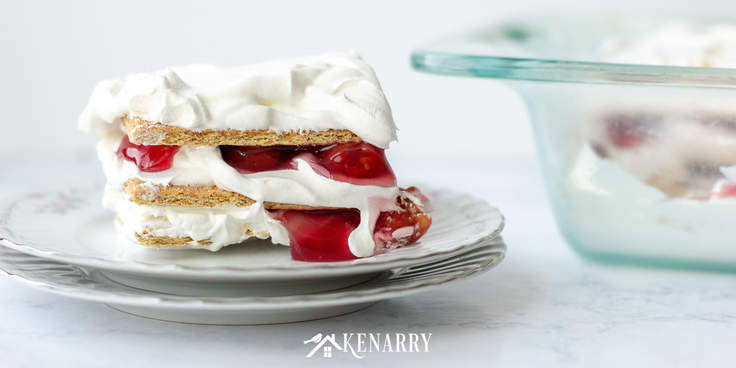 I recommend you check out her delicious recipes for Cherry Pie Bars, Cream Cheese and Cherry Toaster Strudels and Cherry Cheesecake Bites. 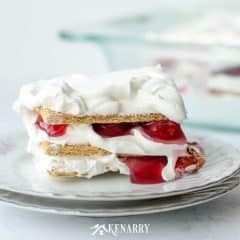 Use this easy recipe for No Bake Cherry Pie Ice Box Cake the next time you want to delight your family at a backyard barbecue, picnic or potluck! It’s made with just 3 ingredients, so it’s a quick dessert idea for summer. Disclosure: This blog post contains affiliate links for products or services we think you’ll like. 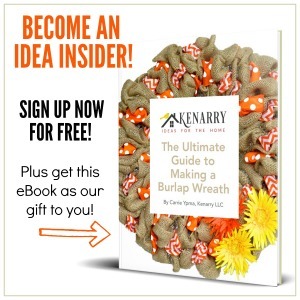 This means if you make a purchase from one of these links, Ideas for the Home by Kenarry™ will make a small commission at no additional cost to you so we can keep the great ideas for the homecoming your way. All opinions expressed are derived from personal experience. 1. Create the first layer. 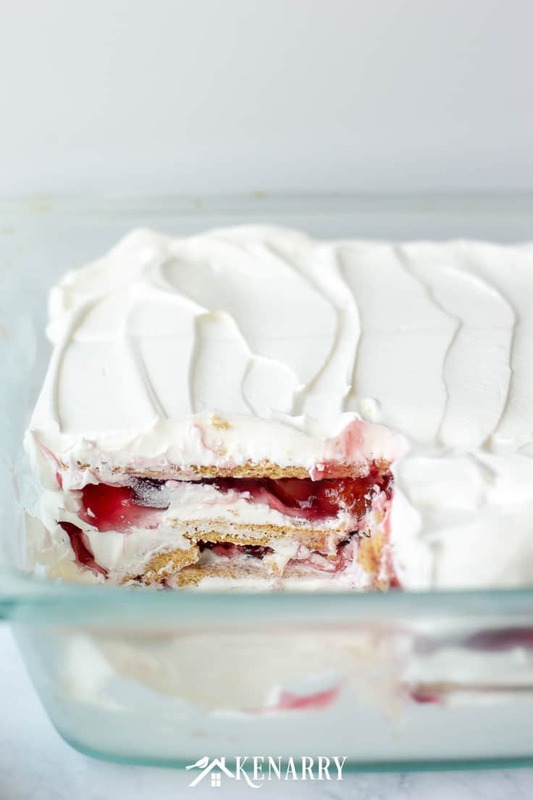 In the bottom of an 8×8 or 9×9 glass baking dish, add three 2 oz scoops of whipped topping. If you don’t have a 2oz cookie scoop, you can use a 1/4 measuring cup. But Meaghan says the scoop makes it SO much easier. Spread the whipped topping evenly with an offset spatula. Next place a single layer of graham crackers on top of the whipped topping. Leave the graham crackers in sheets, but you can break them apart if necessary to fit the dimensions of the glass baking dish. Now add two more scoops of whipped topping and spread evenly on top of the graham crackers. Then pour half the can of cherry pie filling on top of that and spread evenly to complete the first layer. Now you’re going to repeat the whole layering process again, starting with another layer of graham crackers. Then spread two more scoops of whipped topping over the graham crackers. Next, pour and carefully spread the rest of the cherry pie filling. Then finally add a third and final layer of graham crackers followed by the rest of the whipped topping, spreading it evenly. 3. Refrigerate, serve and enjoy! 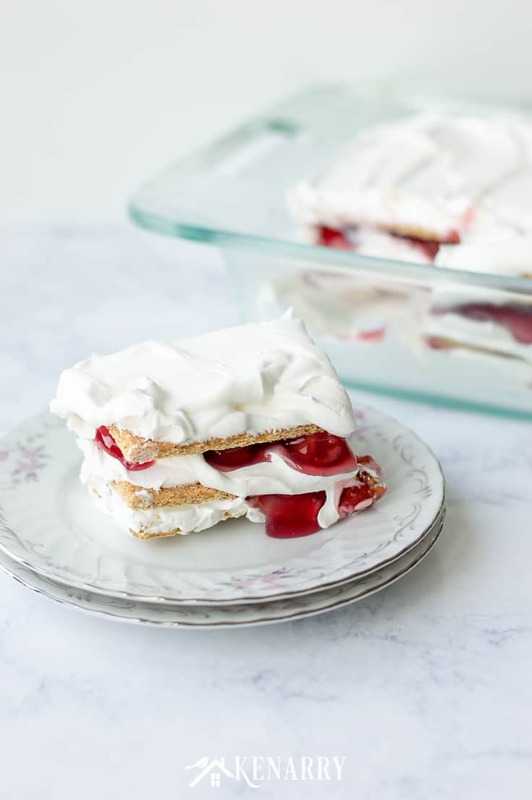 Refrigerate the No Bake Cherry Pie Ice Box Cake for 15 minutes until you’re ready to serve it. Meaghan warns that the graham crackers will soak up the moisture from the whipped topping and get soggy as it sits. So don’t let it sit too long if you don’t like soggy graham crackers! You could also top this no bake cake with red, white and blue sprinkles to make a patriotic treat for the 4th of July. Sprinkle mini chocolate chips between the layers to make it a cherry chocolate dessert. Serve the No Bake Cherry Pie Ice Box Cake in small individual cups as cherry pie parfaits. In the bottom of an 8x8 or 9x9 glass baking dish add 3 scoops of whipped topping and spread evenly with an offset spatula. Add graham crackers in sheets breaking as necessary to fit the sides. Add 2 scoops of whipped topping and spread evenly then add half the can of cherry pie filling and spread evenly. Repeat with another layer of graham crackers, 2 scoops of whipped topping, and the rest of the pie filling. Then add a 3rd and final layer of graham crackers and the rest of the whipped topping and spread evenly. Refrigerate for 15 minutes until ready to serve. This looks amazing. So yummy, and a great hot summer, cool dessert to eat at the end of the day. Will make. We tried it over the weekend and both of my boys scored it a 9 out of 10. Enjoy!